Last week I wrote about Thelanis and the Fey. 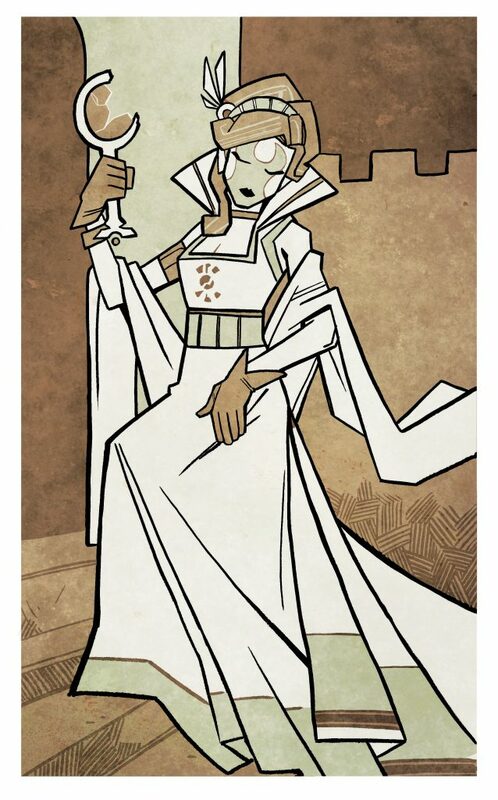 This week I’m posting a few shorter pieces about how to use Thelanis in an Eberron campaign. Today’s topic: Curses! Curses often figure prominently in Faerie stories. The search for a cure may be a driving force in a campaign, or the curse could simply be a burden a character has to bear, something that marks them as an extraordinary individual. Consider a few ways that a curse can work into a story. Ancestral Guilt. A character could be born cursed due to the fault of an ancestor. In Sleeping Beauty the princess is cursed because her parents insult a faerie patron. In the Ulster Cycle Macha curses all the men of Ulster for the actions of their king. Personal Backstory. A curse could be something a character has earned through their own misdeeds, while still being something that is part of a backstory as opposed to happening in play. Your rogue stole from the Tomb of the Forgotten King and the curse has haunted you ever since. A Fey Wronged. One aspect of faerie stories is that power isn’t always consistent. A nymph might have the standard statistics provided by the Monster Manual – being a relatively minor spirit, not an archfey – and still have the power to curse someone who scorns her love. This is especially true if adventurers travel into Thelanis itself. The plane itself is a magical place, and the people who break its rules can suffer consequences. The Price. A curse that afflicts a player character could be the consequence of a negotiated bargain: the character willingly accepts a curse in exchange for a service or goods. This could be part of a backstory – the price of a warlock’s Fey Pact – or it could be part of a campaign, where an archfey offers her assistance provided someone will give up their fame, their heart or their voice. More often than not, fey are more interested in intangible things than in material goods, and it’s part of the unnatural logic of Thelanis that the nymph can offer you something in exchange for your ability to love. Choosing to have a player character cursed from the start of the game may seem like a strange decision, but it’s something that can give an adventurer immediate purpose: What do you need to do to lift this curse of poverty? The best curses don’t affect combat or prevent the character from being an effective adventurer; instead, they shape story, which is what Thelanis is about. Beyond this, a GM might choose to provide a corresponding benefit to a character who willingly takes on a curse. Perhaps the Forgotten King has cursed you with poverty… but you still have the mysterious key you took from his tomb, and some day you may find the door that it opens. Or perhaps your line has ties to two fey sisters; one has always favored you, while the other cursed you out of jealousy. You have to bear the curse, but your patron may come to you in your darkest times to offer advice or assistance. Upcoming Doom. The character will sicken and die when they reach a certain age. Three generations of their ancestors have fallen prey to the curse, and they only have one year to find the answer. Infamy. No one remembers any heroic deeds the character accomplishes. They will be held responsible for all of their misdeeds, but anything good they do will be attributed to someone else (quite possibly other members of the adventuring party). Poverty. All gold, platinum, or gems the character touches disappears within one hour, transported away to fill the coffers of the wronged fey. Loneliness. The character will never find love. The more they love someone, the less the target of their affection will feel for them. Suspicion. A more severe take on Infamy, the character will by default be blamed when things go wrong. People can’t explain it – that character just seems like the kind of person who would be up to something. Cloud of Misfortune. The character themselves doesn’t suffer, but bad things happen to the people they care about. This is primarily aimed at NPCs. If they start to frequent a tavern, it will burn down. Their horse breaks its leg. Their family farm suffers a bad harvest. They should always feel concerned about getting too attached to anyone… because what will happen if they do? Looking to Infamy or Poverty, as described other PCs can mitigate the effects; the cursed character can’t touch gold, so someone else has to handle all transactions. It’s not the end of the world, as long as the other players aren’t jerks about it. But if the cursed character is a rogue who longs for personal wealth, it’s a curse to them. Likewise, shifted fame or lost love is only an issue if love and fame are things the character wants. They won’t stop you from saving a village from marauders; you’ll just have to heave a sigh when the grateful villagers heap their gratitude on everyone but you. In any case, the usual purpose of having a curse is to drive the story in a direction: How can the curse be broken? Is it about righting a wrong committed by an ancestor? Earning the gratitude of the fey you angered? Simply finding a holy person whose power is great enough to override the will of the Fey? Or if it’s the price of your warlock pact, can you find a patron willing to grant you power on better terms? As with many of the previous topics, the primary purpose of curses is to enhance a story. Yes, you defeated that evil dryad… but now you have to deal with her dying curse. Not all players will enjoy such things, but with the right group a curse can be a great way to explore how characters deal with adversity. Share your thoughts, questions, and ideas below. And check out the previous posts on artifacts and manifest zones! Last week I wrote about Thelanis and the Fey. This week I’m posting a few shorter pieces about how to use Thelanis in an Eberron campaign. Today’s topic: Manifest zones! Manifest zones are places where the walls between worlds are thin, where the influence of a plane can be felt on Eberron. A manifest zone could extend for miles, encompassing an entire forest or city… or it could be as small as a single well or a stone arch in the midst of a grove. Every manifest zone influences its environs in a manner connected to its plane. However, two manifest zones tied to the same plane can have wildly different effects. By and large, Thelanian manifest zones tend to impart a sense of otherworldliness to their environs. Plants might be unnaturally healthy, colors especially vivid. This could be idyllic; hostile creatures might avoid the tranquil grove and its always-pure fountain. But it could just as easily be unnaturally menacing. You’re safe in Taiden Wood as long as you stay on the path… but those who venture off the path are rarely seen again. Overall, Thelanian zones tend to fall into one of three categories. Gateways. There are many tales of heroes or adventurers who accidentally find themselves in the Faerie Court, certainly more so than any other plane. This is due to the fact that many Thelanian zones serve as portals between the worlds. These are rarely constantly active. Instead, they are triggered under certain circumstances: a particular confluence of moons; a hunter pursuing a particular beast; someone newly in love, or someone whose heart has just been broken. Needless to say, these circumstances can be whatever you want them to be… as long as this justifies the fact that people aren’t using the portal every day. For purposes of an adventure, this is an easy way to take players to Thelanis. It can happen accidentally; they happen to hit the right circumstances to activate the gate and are suddenly in Thelanis. It may take a while for them to realize this, if the local environs are similar on both sides. More important, the gate may not work both ways – so one of the biggest challenges may be finding a way back! Alternately, the adventurers might know about the gateway and have to figure out how to activate it – whether to escape an unbeatable foe, to find someone who has been lost in Thelanis, or to reach an artifact or ally in the Faerie Court. Beachheads. Sometimes a manifest zone actually brings a piece of Thelanis directly into the material plane. This is the case with the Feyspires introduced in the fourth edition of D&D (and featured in The Fading Dream), and is the general concept of the Twilight Demesne in the Eldeen Reaches. Like the gateways, these are typically temporary. Coterminous periods, phases of the moon, or special circumstances might trigger a beachhead. It could be that the locals know about it and that the arrival of the beachhead is a celebrated and anticipated event… whether by the community as a whole or by a small sect, such as a group of Greensingers who celebrate with the Fey on nights when three moons are full. Or the beachhead may be a cause of alarm – such as Taer Syraen in Karrnath, where the local warlord is concerned that the Feyspire is an invading force. The Feyspires are full cities, but a beachhead could be anything. Perhaps an archfey’s tomb appears once each century, providing a rare chance to delve into this dungeon. Or a monster appears and haunts the region for one night a month; will you track it down before it disappears again? Influence. The most common manifest zones simply bring some of the flavor of Thelanis to the region without offering a direct connection. As described above, this influence could be seen in the environment. You can’t actually go to Thelanis, but you might find a dryad in the woods, or a talking wolf that embodies your fears. Such influence can also be intangible. Perhaps if you make a promise in the grove it must be kept, or if you bury your sword and the hair of a murderer by the blood-red tree it will become a bane blade for purposes of taking vengeance. The critical point is that Thelanis is the place where the world works like a faerie story – and that the manifest zone can bring a touch of that into the real world. You can have magic that doesn’t strictly follow the rules, like the unbreakable vow… or simply something unexpected, like the dryads in the trees. Putting all of this together, here’s a few ideas for Thelanian manifest zones. Taiden Woods. People have always shunned this dark forest. In the past a few local lords have sought to cut it down, but none have succeeded. Some say the trees won’t burn, and that they bleed when cut. All that is none for certain is that there is a path that runs through it, and those who stay on the path are safe… but those who leave it are often never seen again. Walking the Taiden path you may hear lovely voices calling to you, or beautiful music. But if you value your life and those you love, never leave the path. Taiden Wood shows the influence of Thelanis, but the last few sentences suggest the idea of a gateway. It doesn’t always happen, but if you hear the music and follow it you will find yourself in Thelanis – and this is why many of those who leave the path truly never return. Beyond this, the wood is home to a few dryads that don’t like people, some enhanced predators, and a few other lesser fey. The Tomb of the Forgotten King. In the Mror Holds, the old miners tell a story of the Tomb of the Forgotten King. It varies from telling to telling, but core details remain the same. It cannot be found by those who seek it out; instead, it is found when a traveler seeks shelter in a cave and discovers deeper passages. Following these tunnels, they find themselves in a ancient tomb. Jewels are embedded in the walls. Coins are heaped on tables, spilling onto the floor. In some versions of the story, there are guardians patrolling the tomb, spirits of stone and metal. In others there are deadly traps. But one detail remains the same throughout all the tales: treasures taken from the tomb always bring misfortune, curses that linger until the thief finds the tomb again and returns what they have stolen… or until the robber dies. In one story the explorer finds the casket of the king himself, and from it takes the Final Blade, whose wounds cannot be healed. He uses it to settle a feud with a rival clan… only to die when he stumbles and cuts his own wrist with the blade. His daughter returned the blade to the tomb, and it has never been seen again. Here we have a beachhead – a piece of Thelanis that comes and goes. It’s also a dwarven tale, so the fey in this tomb will be spirits of stone and steel. Adventurers could stumble upon this by accident, only to have a dwarven PC recognize it from the tales. Will they seek out the Final Blade? The Grove of Promises. There is a fountain in a nearby forest. No one knows who built it, but its water is clear and pure and it has never run dry. Local stories say that if you make a promise to someone and then share a drink from the fountain that you must keep your word – that if you are false, you will sicken and die. The people of the town perform marriages in the Grove. Young lovers sneak away to pledge their hearts. There are even merchants who like to seal their deals in the Grove. The people of the town never break a promise sworn in the Grove… will you? This is an example of influence. Breaking a vow made on the fountain will afflict the liar with a disease; it can be survived, but it won’t be pleasant. It’s possible that there is actually a fey tied to the fountain who judges such things and can make the punishment more or less severe; and during a coterminous phase, that fey might even be able to manifest and leave the fountain. Post your thoughts or questions below!